I’m always looking for frugal and easy ways to feed my family of seven. And, quite honestly, I look to the slow cooker often just so I won’t have to mess with fixing anything during those busy evening hours. This is a variation of the three packet slow cooker roast because all I had on hand was the one packet of ranch dressing mix. I also added some freshly chopped onion. Cook on low approximately 6-8 hours. What’s on top? Looks like butter (in the midst of the onion). Your roast looks yummy! I’m not very good with a slow cooker (I use all my slow cooker recipe books to make pressure cooker meals in 15 minutes LOL) but I’ll have to try this recipe in my slow cooker. Vicki – that is cream of chicken soup – and I have just now updated the recipe with that ingredient! I was so focused on the yumminess of the roast I left out the soup! 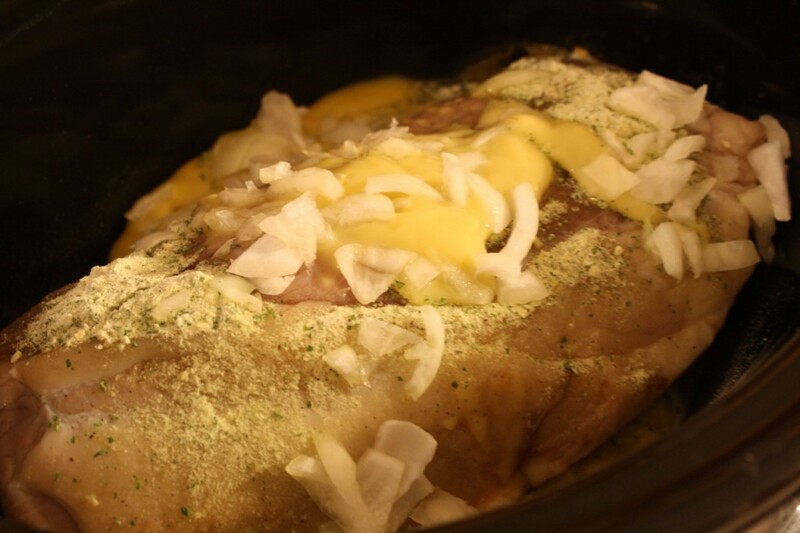 This looks yummy, but I’m always nervous about drying things out in the slow cooker. This comes out well with no liquid? Thanks! I’m looking forward to giving this a try. I do this same recipe with an extra ingredient or two and it’s always delicious and easy. Add a packet of cream cheese and some cubed potatoes on the bottom and you will have an easy one dish meal. Thanks for the recipe! crazy question, but this really looks like a pork roast. Is it beef (recipe states) or pork?? It really is a beef round roast! But I bet this would be great with a pork loin too, Connie. I am using pork roast. I bet it’s good and just as good as beef. I have to be REALLY careful with my budget. How much did the roast cost? Most nights I cook for family of 4, while sometimes we’ve got a couple extra ‘grands’ on us. I’m pretty sure a 3-pound roast would make at least 2 meals for us, and MAN does that Ranch one sound delish! Yes, Jen. 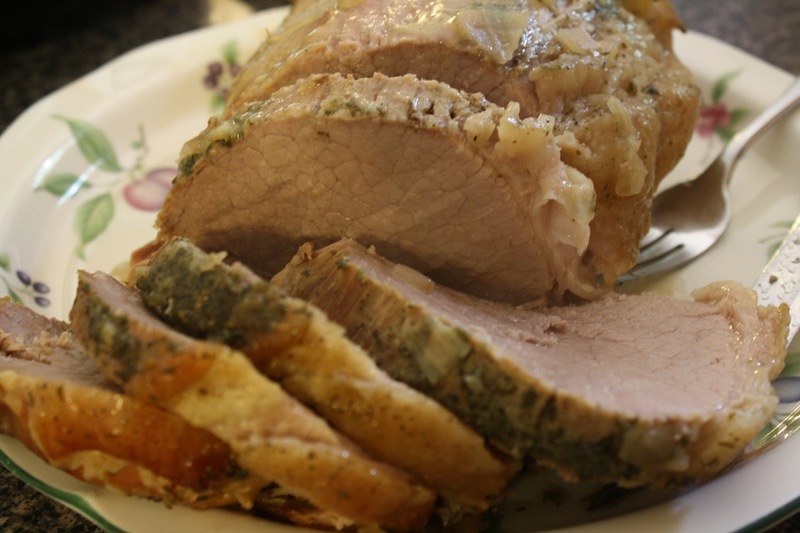 I have a larger family – and this roast actually fed my family of seven plus my brother’s family (2 adults, one child) and Nana! So, feel free to get the size that is most affordable for you and your family. I’m sure that the amounts above would also work for a slightly smaller roast. Or if you feel like it’s too much then cut back and just add 3/4 of the ranch packet.